Copyright Mie Prefecture Forestry Research Institute All Rights Reserved. 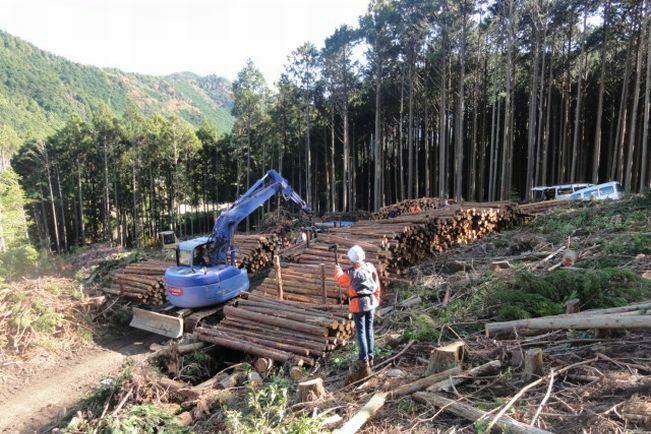 The Mie Prefecture Forestry Research Institute is researching and developing a system known as e-forest, a forest management system that simplifies forest management plans and regenerates healthy forests. The study period is scheduled to last five years, from fiscal 2010 to 2014. When the objectives of the e-forest research are attained, the system will function as a support tool for forest management and forestry plan formulation. For example, the new system is expected to help the regeneration of a poorly managed planted forest through proposals of techniques for tree thinning and forest restoration suitable for the actual conditions of the forest. Consequently, the system will contribute to more efficient management and regeneration of forests, and the promotion of the utilization of thinned woods. Targeting forest constituting about 3,300 hectares in Odai Town, Mie Prefecture, as a model area, the study group will build a database of forest resources based on data on current forest conditions and the transportation costs of thinned wood, and develop techniques to forecast growth and determine management effects. Integrating these results, the research group will develop a forest management system for actual use to support forest regeneration and promote the utilization of thinned woods. The research is being carried out jointly by Toyota Motor Corp., Chubu Electric Power Co., Forest Revitalization Systems Corp., Mie University, University of Tsukuba, Forestry and Forest Products Research Institute, and Odai Town Hall, Mie Prefecture. This research project utilizes the research fund of science and technology research promotion program for agriculture, forestry, fisheries and food industry. A Small but Lively Town-Oguni-cho, Kumamoto Pref.